The much awaited Nokia phone for Nokia fanatics is now here in Saudi Arabia. 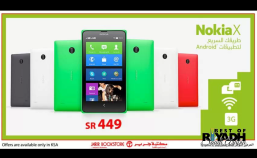 Yesterday, Jarir Bookstore have announced on the facebook page that the Nokia x is now available in KSA for SAR 449. This is the only Nokia phone that runs Android Open Source Platform (AOSP) so it can run Android apps. The phone does not have Google play but application could be downloaded via Nokia store, or if you know the source of APK files, the application could be installed without a problem. Nokia X has been launched in different part of the world recently particular in ASIA.